Diabetes and Pre-Diabetes is affecting over 80 million Americans. It is estimated to contribute to the death of over 400,000 Americans per year. This #1 best-seller shows you in clear, easy to understand language everything from what diabetes is to how you can defeat this silent killer. Don’t hesitate. Start getting healthier today. better! My A 1 c was 8.5 but I am determined to follow this plan and lower it! Proper management of diabetes from the earliest stages is essential. If you’ve been diagnosed with type 2 diabetes or prediabetes, this authoritative guide to preventing, reversing, and managing the disease provides the help you need right now. 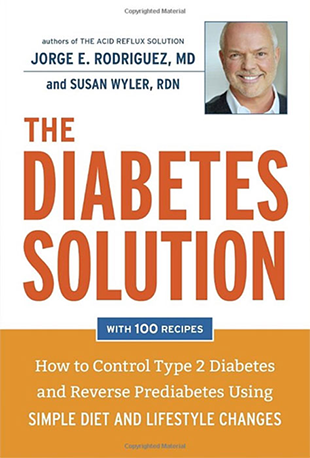 In The Diabetes Solution, Dr. Jorge Rodriguez and dietitian nutritionist Susan Wyler tell you everything you need to know about this increasingly common disease—from diagnosis to treatment—including the difference between prediabetes and diabetes, ways to prevent serious complications, and the most effective medications and when to start taking them. Many studies prove that a minor weight loss of 5 to 7 percent can make a huge difference in blood sugar levels and diabetic status—an easily achievable goal with The Diabetes Solution’s simple diet plan based on the latest scientifically validated information. The Blood Sugar Budget, a point-based program developed specifically for controlling blood sugar, tells you exactly what to eat and when, and features recipes for 100 tasty dishes that control carb consumption, limit calories, and encourage weight loss. This comprehensive yet accessible guide will show you how to diminish stress, exercise smart, and eat surprisingly well while reducing permanent damage and eliminating future complications. Whether you’re newly diagnosed or have been told you’re at risk, The Diabetes Solution will help you take control of your health and thrive. The author provides a nice overview of diabetes. He presents a point system for managing input of carbohydrates much like that used by weight watchers for caloric intake. The author emphasizes weight loss, exercise, and diet. He does not provde suggestions for those who already exercise regularly and are already thin. This population exists and is not recognizd.